The magic of the sea floor and the diving experience into such a familiar yet unknown world -the sea world of the Mediterranean - cannot be described in just a few words. This is the reason why we present some of the most interesting species to you during your tour at CretAquarium, as they are preserved in their particular ecosystems. A small virtual tour that follows the sequence of the section along the route path of the aquarium and that we hope it will inspire and alert you! The sun light, a vital source of energy even for the sea world, is not present everywhere and forever. 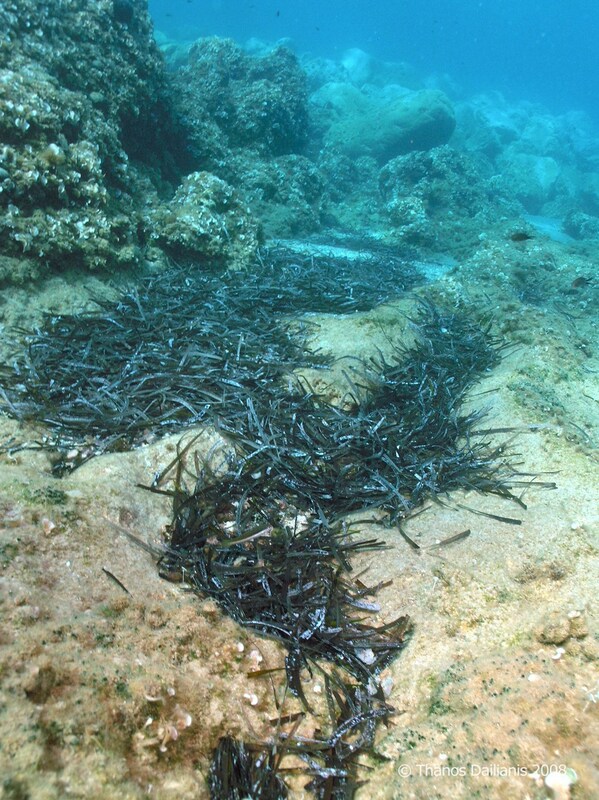 In the sea are dark areas home to countless organisms. The areas of great depths, the caves, the cracks and the protrusions of the rocks hide interesting and diverse and unique encounters, as well as rich and beautiful ones, like areas of plentiful light. In the first section of your CretAquarium visit, low light conditions prevail and you will admire, among others, dusky groupers, red corals, crayfish, gorgonians, skates etc. Stingrays love sandy bottoms as they offer them perfect cover to set their deadly traps to their small preys. Their secret weapon is not other than the poisonous sting at the end of their tails that can reach 35 cm in length. A stingray will not hesitate to use it even against people if it feels threatened and in this case it can cause serious injuries, even local paralysis. Stingrays reproduce by ovoviviparity, namely eggs are retained within the mother's womb until they are ready to hatch. Dusky groupers are indolent hunters off rocky coasts. Despite its large size and undisturbed look, a dusky grouper is a scary hunter equipped with powerful jaws. Octopuses are its favourite prey; however, it can be fed with fish and crabs. The large males impose on their territory like real rulers, but what most do not know is that the mature male dusky groupers were first born… female! According to species studies, the dusky grouper can reach 1.5m in length and live for 50 years; however we seldom meet dusky groupers of this size in the Mediterranean, due to large population decline. Seemingly immovable as a rock, but in fact fast as lightning! The red scorpionfish remains patiently motionless, camouflaged as a stone full of seaweed until the appropriate time comes to attack its prey of preferably crustaceans. Its secret weapons are the poisonous thorns that rise and are ready to attack without prior warning. If it feels it is in danger, the red scorpion fish remains in its position, confident of the successful camouflage and only at the last moment, if it feels that has been identified, it moves quickly to hide elsewhere. The red scorpion fish is usually found in depths exceeding 20m. The open sea of the Mediterranean, the world of numerous flocks of pelagic fish, marine mammals, large predators and of course sharks! A world seemingly monotonous and monochromatic, with sandy and muddy bottoms, yet diversity is endless on the Mediterranean sea floor and this monotony is interrupted by rocky reefs, rich in shapes and colours. In the second part of the CretAquarium, darkness comes into light and visitors view large 600m3 and 400m3 capacity tanks. The scenery is inspired from the sea bed of Matala and Vai. Amongst others, you will have the chance to see greater amberjacks, groupers, santer seabreams, and European seabasses. The sea turtle Caretta Caretta is one of the most emblematic species of the Mediterranean. It lives for approximately 80 years, and seldom reaches 1m in length. It feeds on jellyfish, molluscs, crustaceans, etc. As it is a marine reptile, the turtle has lungs to breathe and it comes to the sea surface. One of its most particular characteristics of the turtle Caretta Caretta is that it returns to the same sandy beach it was born in order to lay its own eggs. The eggs hatch after 55 days and the babies start their journey to the sea, a difficult journey that just 1 in 1000 baby turtles manage to survive. Lucky visitors may see the turtles temporarily hosted at Cretaquarium. They come to the Aquarium injured and after they are cured, they are set free to their natural habitat. The Sand Tiger Shark can reach more than 3m in length and 150kg in weight, you should not, however, be fooled by the size, strength and fearsome teeth: in reality, it does not pose a threat to humans. It tends to get aggressive only when it gets frustrated. It lives in the warm waters of the world, also in the Mediterranean, and travels in small groups or alone and feeds on fish. re than just water or salt. 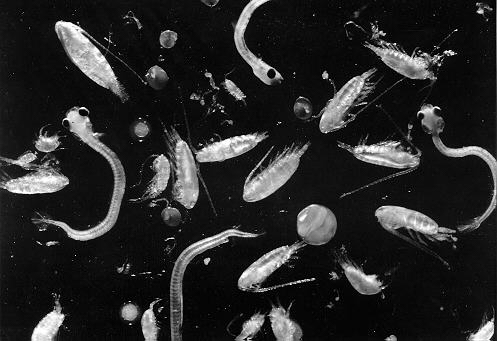 A rich microcosmos is hidden in the sea water, unknown to most and invisible to human eye: plankton, a rare and valuable source of life. The third section of CretAquarium is dedicated to the plankton and plankton-eating organisms! One of the most famous as well as intelligent molluscs. With eight legs and natural intelligence, it hunts molluscs and crustaceans and spreads panic to shellfish whose protective shells are broken by the powerful tentacles and hard teeth. The octopus is a master of disguise, as it uses its tentacles to move stones and empty shells in order to cover the entrance of its den. It feeds on molluscs and despite its hard outer shell, its claws are not large. Unfortunately, it is easy prey for many hunters, humans included. Its meet is recherché and is subject of intensive fishing. In most states of the Mediterranean, various protection fishing measures are nowadays in place, while some states have totally banned its fishing. The tour continues to the biotopes of the coastal areas, to the most productive ecosystems of the world. There one encounters rocky bottoms and soft muddy, sandy or gravel bottoms, areas with sea plants that really look like underwater meadows, as well as many and various dens, caves and protruding parts of rocks. At the same time, the palette of colours and shapes is inexhaustible and adaptation strategies of species living here are amazing! Parrotfish, rainbow wrasses, anemones, crustaceans, echinoderms are some of the species you will notice in this section. A plant or an animal? You may be fooled by its appearance, however, it is a sea animal. The sea anemone is also called the "sea nettle" as it has itchy cells which secrete a poison capable of killing small organisms and deterring possible attacks. It is a complicated system for a rather primitive animal. To humans, the sea anemone is totally harmless and only if humans are sensitive to its touch the poison can cause a skin rash. its hiding places at night. Its most characteristic feature, however, is its long antennae with which it explores the environment, communicates with other lobsters and intimidates others. Its claws are not used for feeding; instead it uses the front legs found next to its mouth. These are used to break the shells of sea urchins and molluscs. The female lobster, when it wants to mate, attracts male ones using particular sounds that tend to stop when the first male lobster touches its antennas on the ones of the female lobster. Unfortunately, the lobster is threatened by intensive fishing. The Aquarium beyond the glass! A section slightly different to the others! Visitors have the opportunity to see some sea visitors in shallow open tanks from a small distance, to observe the secrets of tank-making and their function. Do not be fooled though! It is a ruthless predator trapping zooplankton in the tentacles or on the mucoid substance covering its body. You may possibly had an encounter with it before, as it lives in small depths in all the seas of the world. At the aquarium, there is no need to get worried by its painful touch.. you may enjoy its palming dance, a movement that allows it to remain at the preferred depth. The rainbow wrasse lives close to shore and rocks and feeds on invertebrates. There is nothing unusual so far. What is interesting about this fish is how it organizes its social life. The largest ones in size, with more vibrant colours, are the dominating males that have been evolved from… female ones! In spring, these dominating males create "harems", attracting the females of their territory. The young males that have need born male tend to live as faithful attendants of the dominant male, or live on the margin, trying to attract females of the harem to fertilize their eggs. The last section of the Aquarium is dedicated to the tropical species and to otherwise known as “lessepsian migrants”. The construction of the Suez Canal that connects the Mediterranean with the Red Sea has caused biogeographical unprecedented upheavals in the Mediterranean. Since it was constructed, various tropical species started to cross the canal and driven by the currents, they made their presence in the Mediterranean. Gradually, some of them settled in and became permanent residents. These immigrating species are called “lessepsian” honouring Ferdinand de Lesseps, the developer of the Canal. Apart from those "immigrants”, this section includes other tropical species that we host from distant seas! Just like a clown, the clown anemonefish distinguishes itself by its fancy colours. It has many cousins, most famous of all is Nemo, a clown fish with three colour zones that inspired the famous Disney movie. The clown fish is the only one that manages to fool the anemone and gets close to its poisonous tentacles by using a small technique: chemical camouflage from its own mucus. It lives together with the anemone, as a couple does, and usually feeds on zooplankton. Another immigrant fish that possibly came to the Mediterranean through the Suez Canal during the 80s. The cobia live in shoals in all the warm seas of the world, feed on crustaceans, fish and mollusks and are skilful hunters. They usually reach 50-120 cm in length and it is no surprise if they reach even 3 m in length! Today, there are two types of them in the Mediterranean: one type is Siganus Rivulatus that usually has yellow horizontal stripes across its belly and the other one is Siganus Luridus that has darker colours, olive green-brown, that can change. Their caudal fin is the feature that distinguishes them: The fin of Siganus Luridus is straight at its end, whereas the one of Siganus Rivulatus has a slight curve.